Personalized Address Plaque with QR Code Block - - custom made with the QR code you specify, your address, and color you select. Wall mount. Made in USA. This very unique 7.5" x 10" rectangle address sign is made from sturdy and UV-stabilized laminated acrylic with engraved QR code information block and house number. A QR code (Quick Response Code) is a machine-readable optical label that contains information about the item to which it is attached. The QR code enables passersby to scan the sign with their mobile phone and be directly connected to a website for more information or provided with contact information. The scannable QR code image is the same color as the personalized address. Your QR Code information can consist of up to 50 characters that might include, but is not limited to, your website URL, a phone number, a contact name, or a slogan. The characters you type into the QR Code input box are subsequently transformed into the scan-enabled QR code that appears on your sign. After scanning the code with a smart phone reader, the person just clicks on the URL to be connected to the Comfort House website. In addition to the QR code, this plaque contains one address line with up to four (4) 3.5" characters. Note: the style number you see on the sample sign is for internal use only and is not part of your custom sign. Dimensions: 7.5"W x 10"H x 1/8". This sign can also be mounted on the Comfort House CGS24001 lawn stake (shown in Related Products). 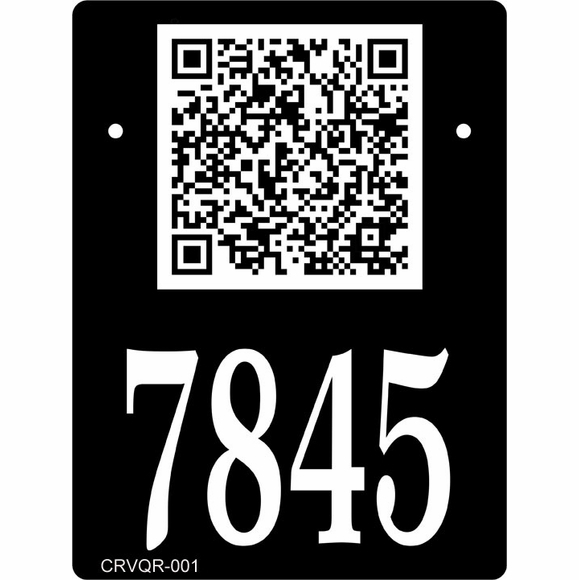 Personalized Address Sign with QR Code Information Block includes a QR code that can be scanned. Made in USA.